Charlie’s got a ‘job’ to do. 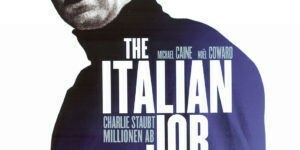 Having just left prison he finds one his of friends has attempted a high risk job in Italy, right under the nose of the mafia. Charlie’s friend doesn’t get very far, so Charlie takes over the ‘job’. Using three Mini Coopers, a couple of Jaguars and a bus, he hopes to bring Torino to a standstill, steal a fortune in gold and escape in the chaos.